Couscous, I have missed you. Your quick cooking time, your delightful nuggety-ness, your ability to soak up tasty dressings and sauces. But alas, couscous is made of little bits of gluteny semolina flour and so we haven't enjoyed it at our house for the last five years. Lundberg Family Farms, a family-owned rice farm in California, has launched a new product line of Brown Rice Couscous. They take their organic brown rice, grind it up into small pieces, roast it and then package it up plain, or with seasoning packets to make three other flavors: Savory Herb, Mediterranean Curry (my favorite) and Roasted Garlic and Olive Oil. Lundberg Farms sent me a package each of their four flavors of Brown Rice Couscous to try and I can enthusiastically endorse it. What a great product. It's got great fiber from the brown rice, it's kosher and vegan in addition to being gluten-free, and it can be used as a quick side dish to zip up simple dinners or as an ingredient in a casserole or main dish salad. While this rice couscous is not quite as quick cooking as wheat-based couscous which I used to throw into boiling water, cover, take off the heat and let steam for 5-10 minutes, it is only a little more time intensive, with a fifteen minute cooking time after tossing in the brown rice couscous into boiling water. I found all four varieties of Lundberg Farms Brown Rice Couscous at my local Hannaford's supermarket where they were selling for $3.19 a box. I also noticed that Lundberg Farms is the source of the brown rice in the Hannaford Bulk Foods Bin, so that was interesting. 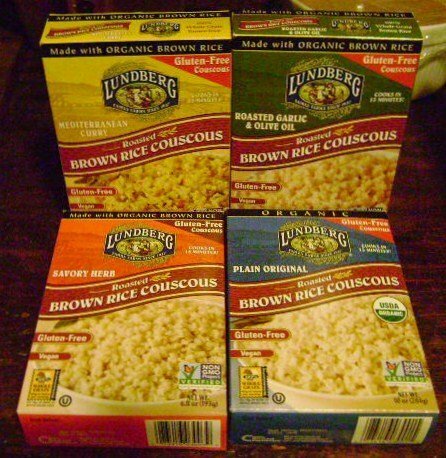 There are some great recipes for all kinds of rice dishes on the Lundberg Farms website as well as other information, including a printable coupon for 75 cents off the Brown Rice Couscous so you might want to stop over and check it out. * Disclosure: Thank you to Lundberg Farms for sending me these four boxes of couscous to sample. I received these items for free, but was not compensated otherwise. My opinions are completely my own and I was not influenced by this company to write a positive review. And that's always the way it is on The Crispy Cook with my product reviews. I haven't had couscous in forever - will have to try this out! Awesome review! If I ever have a person with celiac's coming to dinner, I'll know where I can turn for some good quality pasta/couscous! Couscous is one of my favorites-have you ever tried quiona? Esme: Quinoa is great too. I like the little crunchy bits and it's my favorite grain for making tabbouleh. But this brown rice couscous is a bit heartier in texture and it's nice to have more whole grain options.